What conditions does Synarel Spray, Non-Aerosol treat? Tell the doctor right away if any of these serious side effects occur: mental/mood changes (such as depression, thoughts of suicide, mood swings, aggression). 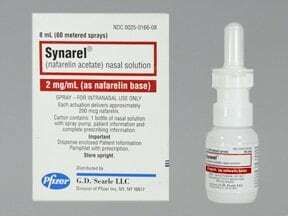 Rarely, a very serious problem with the pituitary gland (pituitary apoplexy) may occur, usually in the first hour to 2 weeks after the first dose of this medication. Get medical help right away if any of these very serious side effects occur: sudden severe headache, sudden severe mental/mood changes (such as severe confusion, difficulty concentrating), vision changes, vomiting. For women using this medication, tell your doctor right away if you have any serious side effects, including: abdominal/lower back pain, bone pain, fast/pounding heartbeat, numbness/tingling of arms/legs, eye pain. List Synarel Spray, Non-Aerosol side effects by likelihood and severity. Before using this medication, tell your doctor or pharmacist your medical history, especially of: unexplained abnormal vaginal bleeding, smoking, daily alcohol use, bone loss (osteoporosis) or family history of osteoporosis, polycystic ovarian disease, high cholesterol/triglyceride levels, seizures, mental/mood problems (such as depression). What should I know regarding pregnancy, nursing and administering Synarel Spray, Non-Aerosol to children or the elderly? Are you taking Synarel Spray, Non-Aerosol? Are you considering switching to Synarel Spray, Non-Aerosol? How long have you been taking Synarel Spray, Non-Aerosol?